Context: I am Vladimir, 16-years old, only child of ill-matched parents. I recently visited our new neighbor - Princess Zayeskin - and got infatuated by her daughter, Zinaida, a 21-year old. The next morning, when I came down to tea, my mother scolded me - less severely, however, than I had expected - and made me tell her how I had spent the previous evening. I answered her in few words, omitting many details, and trying to give the most innocent air to everything. As I was well aware that my mother's anxiety about my studies was confined to these few words, I did not feel it necessary to make any rejoinder; but after morning tea was over, my father took me by the arm, and turning into the garden with me, forced me to tell him all I had seen at the Zasyekins'. A curious influence my father had over me, and curious were the relations existing between us. He took hardly any interest in my education, but he never hurt my feelings; he respected my freedom, he treated me - if I may so express it - with courtesy,.. only he never let me be really close to him. I loved him, I admired him, he was my ideal of a man - and Heavens! how passionately devoted I should have been to him, if I had not been continually conscious of his holding me off! But when he liked, he could almost instantaneously, by a single word, a single gesture, call forth an unbounded confidence in him. My soul expanded, I chattered away to him, as to a wise friend, a kindly teacher .. then he as suddenly got rid of me, and again he was keeping me off, gently and affectionately, but still he kept me off. 'My father, before all, and above all, desired to live, and lived.. . Perhaps he had a presentiment that he would not have long to enjoy the 'savour' of life: he died at forty-two. I described my evening at the Zasyekins' minutely to my father. Half attentively, half carelessly, he listened to me, sitting on a garden seat, drawing in the sand with his cane. Now and then he laughed, shot bright, droll glances at me, and spurred me on with short questions and assents. At first I could not bring myself even to utter the name of Zinaida, but I could not restrain myself long, and began singing her praises. My father still laughed; then he grew thoughtful, stretched, and got up. I remembered that as he came out of the house he had ordered his horse to be saddled. He was a splendid horseman, and, long before Rarey, had the secret of breaking in the most vicious horses. 'Shall I come with you, father?' I asked. He turned his back on me and walked rapidly away. I looked after him; he disappeared through the gates. I saw his hat moving along beside the fence; he went into the Zasyekins'. He stayed there not more than an hour, but then departed at once for the town, and did not return home till evening. After dinner I went myself to the Zasyekins'. In the drawing-room I found only the old princess. On seeing me she scratched her head under her cap with a knitting-needle, and suddenly asked me, could I copy a petition for her. 'With pleasure,' I replied, sitting down on the edge of a chair. The door of the next room was just opened, and in the crack I saw the face of Zinaida, pale and pensive, her hair flung carelessly back; she stared at me with big chilly eyes, and softly closed the door. 'Zina, Zina!' called the old lady. Zinaida made no response. I took home the old lady's petition and spent the whole evening over it. 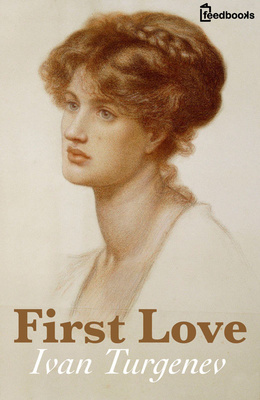 First Love is one of the most popular pieces of short fiction. It tells the love story between a 21-year-old girl and a 16-year-old boy. The book is set in Russia in the mid 1800s.